For the second time in promotional history, a series of The Ultimate Fighter will crown a UFC champion. The first fighter to earn gold through a TUF tournament, Carla Esparza, holds the unwanted record for the shortest title reign in UFC history at just 92 days. The winner of this season’s finale- between Nicco Montaño (3-2 MMA, 0-0 UFC) and Roxanne Modafferi (21-13 MMA, 0-1 UFC), will be hoping for a slightly longer title reign. Montaño, who was seeded 14th before the tournament began, upset 4-fight UFC veteran Lauren Murphy (#3 seed) in the round of 16, before defeating Montana De La Rosa (#6 seed) in the quarter-finals, with both victories coming via unanimous decision. Her biggest upset was saved for last, where Montaño defeated former Invicta flyweight champion Barb Honchak (#2 seed), who is on a 9-fight winning streak in professional MMA competition (excluding these TUF exhibition bouts). Modafferi, the 1st seed, progressed to the semi-finals after back-to-back first-round TKO victories over Shana Dobson (#16 seed) and Emily Whitmire (#8 seed). In the semis, Modafferi came up short in a unanimous decision loss to Sijara Eubanks (#12 seed), who was originally set to contest for the title until weight-cutting complications left her hospitalized and led to her withdrawal just 24 hours before the event. Eubanks’ loss was Modafferi’s gain, as the 34-fight veteran was brought in as a last-minute replacement to face Montaño for UFC gold. Here’s a look at how these two fighters fared when competing against common opponents shared throughout their careers. On the left of the graphic, you’ll see how Montaño fared against any shared opponents, and on the right, you’ll see Modafferi’s results against the same women. Montaño and Modafferi share two common opponents; Shana Dobson and Barb Honchak, with Montaño going 2-0 against the pair, whilst Modafferi went 1-1 in those bouts. TUF 26 Finale: Nicco Montaño vs. Roxanne Modafferi checks in with a Dwyer Score of -2. This relatively low score is hardly surprising, given the fact that 64% of fighters on the card (14 out of 22) are entering off the back of fights in other promotions. This score ranks 29th of 35 events in 2017 and is the 9th event to post a negative Dwyer Score this year, compared to just 4 in 2016. This score falls short of the +2.9 average for Fight Nights (including TUF Finales) this year, as well as the +10.8 average for all events. The highest individual contributor to the score is former UFC bantamweight title challenger Joe Soto (+3), just ahead of his opponent on Friday night, Brett Johns (+2). In fact, that is the only fight on the card that features a fighter coming off a UFC win. The lowest scorer is Ryan Janes (-2). 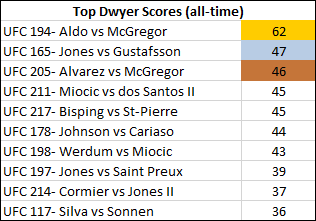 The following night, UFC 218 posts a Dwyer Score of +38. It’s the ninth-highest score in UFC’s 421-event history and is undoubtedly a fantastic card. Friday’s TUF Finale may pale in comparison, but if this event is just the starter before Saturday’s main course, a starter served with UFC championship gold will suffice.